My friend Sarah is epic. Seriously. When she makes s'mores, she makes them from scratch - from the graham crackers to the marshmallows. Her baked goods are legendary, and her kitchen is like Disneyland compared to my own meager gadget offerings. Read on to the end of this post to meet Martha and Stewart Siamese and Sarah herself! Lucky for us, Sarah and I are going to be working together on some foods features from now on! This first one is amazing - super easy with a huge impact and high gifting potential! 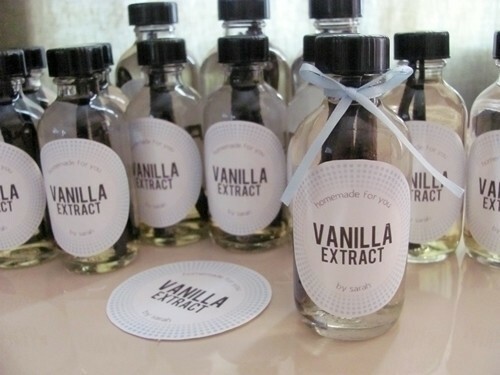 You're going to need one vanilla bean for a two-ounce bottle and two beans for a 4 ounce bottle. Cut them each in half so that they'll fit in the bottle. When you cut them, all the little seeds will ooze out the cut ends. It looks kind of like caviar, which is pretty sick, but it smells awesome, which is not sick at all. Now you're going to slice down the length. Make sure you start the cut about half an inch from the end so that it stays together. You just want to cut it open to release the seeds and flavors. You can do this with kitchen scissors or a good, sharp paring knife. Stuff your beans into the bottle. 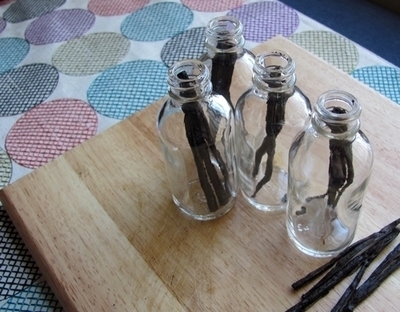 So, for the little bottles, you'll stuff two halves in, for a total of one bean. For the bigger bottles, you'll put it four halves, for a total of two beans. 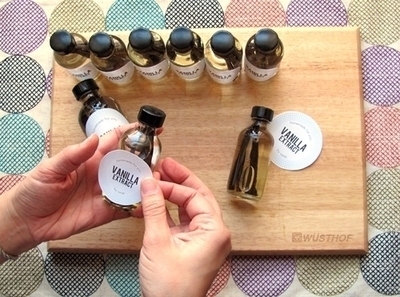 If they poke out the top, especially on the smaller bottles, you can push them in further, and they should bend. 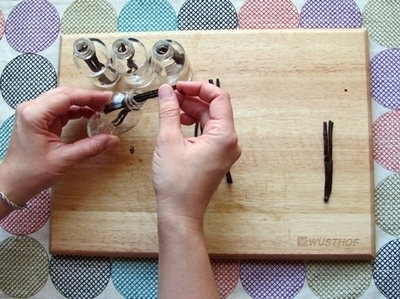 If you can't bend it, just snip off the ends with your kitchen scissors or paring knife. Booze time! 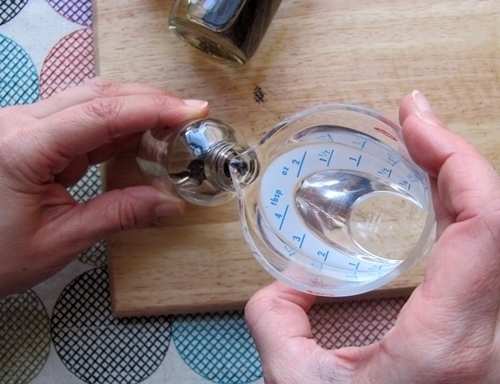 Use a funnel with a small end, or if you don't have one that'll fit into the bottle opening, just use a measuring cup with a little spout. Top each bottle off with straight vodka. This is about when your pretty little project starts looking like a bunch of specimen jars off American Horror Story or something. Power through - it'll be pretty soon. 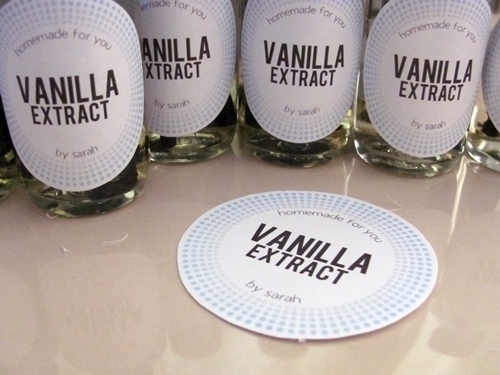 Definitely do this last so that you don't drip anything on the label and ruin it. 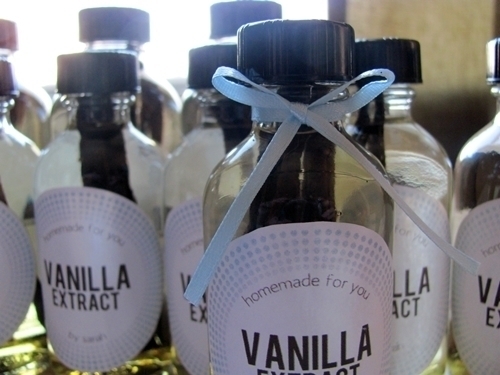 Tie a cute little bow around the neck, and your vanilla is officially gift-worthy! We used one-inch ribbon because the neck is so short on these. 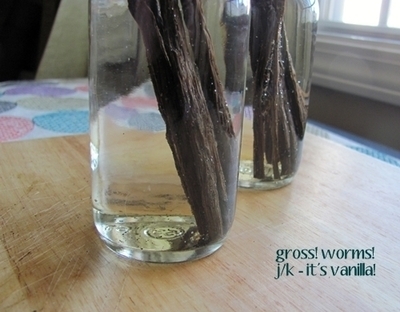 Store the bottles in a cool, dry place for about two months. You should take them out and shake them up weekly. They'll start to develop that rich, brown color over time (which will look awesome with the light blue labels, by the way!). So what about the alcohol.. I mean, let's say I will use this in a (liquidy/creamy) desert, won't the taste of vodka/taste of the alcohol in the vodka be all over the place? I have zero experience with vodka, so all I know is that it doesn't smell.. but what about the taste? Besides that, I'd LOVE to make this.. Here I am, responding to my own question with the answer I found on your own website.. 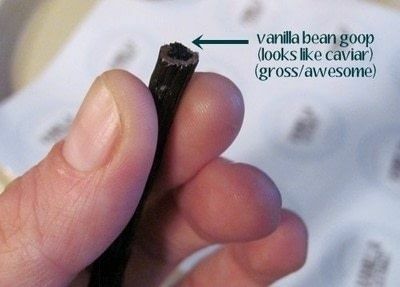 Does regular vanilla that we buy in the store have vodka in it? 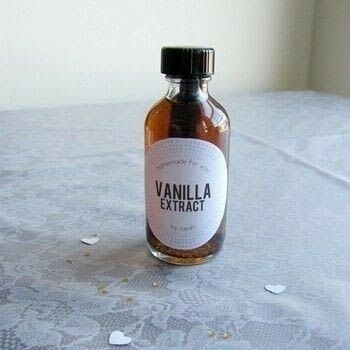 Once the two month infusing is done do you use it like regular store bought vanilla and do you taste the vodka in it? Sorry about the questions but I would love to do this but have friends that do 12 step programs and of course they cannot have the vodka. thanks for your time and great ideas. I'm so glad you like the project, everyone! Anonymous - Regular vanilla in the store also has a high concentration of alcohol. It's what extracts and preserves the flavor from the beans. I think vodka is the alcohol of choice for diy because it's got a clean, neutral flavor compared to other liquors. 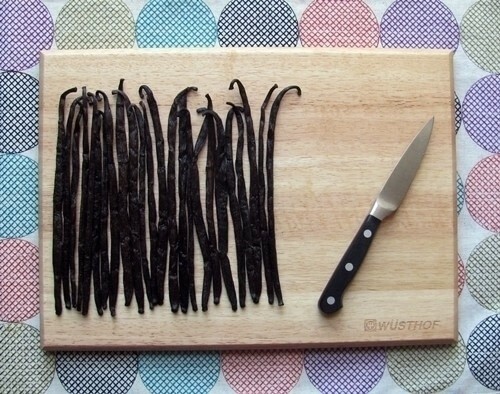 When you've infused it, you can use it just like regular store-bought vanilla. 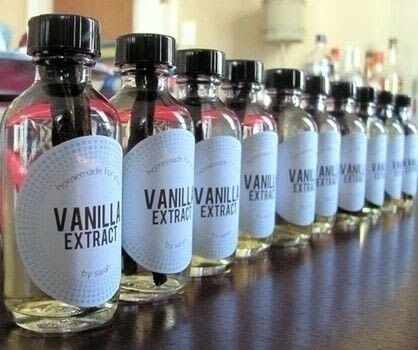 You won't taste vodka, you'll taste the strong, bitter vanilla flavor, just as you do with store-bought. when you cook with something that has alcohol. The alcohol burns off at 95C, so any form of cooking will totally take the vodka away. Best bottles is a great source! And you don't need a ginormous amount to place an order.